Whether you’ve got a wet basement after a big rain or if you’re starting to notice a crack in your basement wall starting to form, our team is here to help. Rapid Dri Foundation Repair and Waterproofing has a team of trained professionals who will make a proper evaluation of the flooding or cracks you’re having and after the inspection, assist you determine the best options to take care of the issues once and for all and even prevent the problems from returning. Rapid Dri serves the western and northwestern Detroit suburbs and southeastern Michigan including the Walled Lake area. It is crucial that once you’ve seen an issue with the basement, foundation, or crawl space that you get in touch with an experienced repair company. We recommend this as there are a number of additional issues that can happen along with these issues including black mold, structural damage, and even permanent foundation damage. If you are in need of our basement waterproofing services to control water entering your home, foundation repair products to stabilize your foundation, or crawl space services to control mold growth in the crawl space, our experts are here to help you. If you’ve seen stagnant water in the basement after a big storm, this is not good. If this water is not removed, it can prevent you from having the ability to keep items in the area and even prevent you from turning that space into another room. Excess water and humidity will eventually harbor mold and mildew which could ultimately be a cause of health problems. If you’ve seen standing water in the basement, you should get in touch with us so a member of our team can evaluate the issue and help come up with a basement waterproofing solution which can control water coming in and prevent unnecessary damage from occurring. This can also prevent the growth of mold and also help so you can be able to turn the basement into viable storage space, a second family room, or even an additional bedroom. If you’re seeing cracking in the foundation or if you’ve noticed them at the corners of the window or doors, this is an indicator that there is a problem with the foundation and you are in need of foundation repair. An additional sign could be the doors or windows being difficult to open or close or even not moving when moving them. Sinking foundations are commonplace in the Walled Lake area as a result of the moisture content of the soil go up and down throughout the year. They are occasionally caused by improper soil compaction during original construction of the home. Our professionals can install a system of piers under your foundation which will shift the weight of your home to the piers and prevent the foundation from sinking or settling in the future. 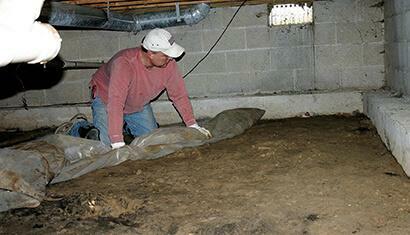 If you have a a crawl space, it is most likely a location that you will only visit when there is a noticeable problem. This is because they are usually poorly closed off and are frequently unkempt, dirty, and can have critters living in them. They are notorious for having excess moisture problems that could cause damage to the floor joists and even enable mold to grow. Our experts know one of the best ways to prevent issues in crawl spaces is to encapsulate them and close them off from the outside. This will control excess moisture and humidity in addition to controlling the entry of unwanted pests. If you have sloping floors above the crawl space, we can install a series of jacks to lift and stabilize the floor joists and level the sagging floor. To further prevent excess moisture, we can install a specialized crawl space dehumidifier to remove the excess humidity and prevent the growth of mold.